The Lane House was is located at 544 S.E. Douglas Ave., in Roseburg, Or. This house has served as headquarters of the Douglas County Historical Society since 1959 when the great granddaughter of General Joseph Lane deeded, this last home of the General, to the society. Through the efforts of Mrs. Alvia Wetherell, a long time treasurer of the society, this home is on the National Registry of Historic Places. Lane House contains many historical artifacts and is open to the public Saturdays and Sundays from 1:00 until 4:00 p.m. The tour is free of charge. 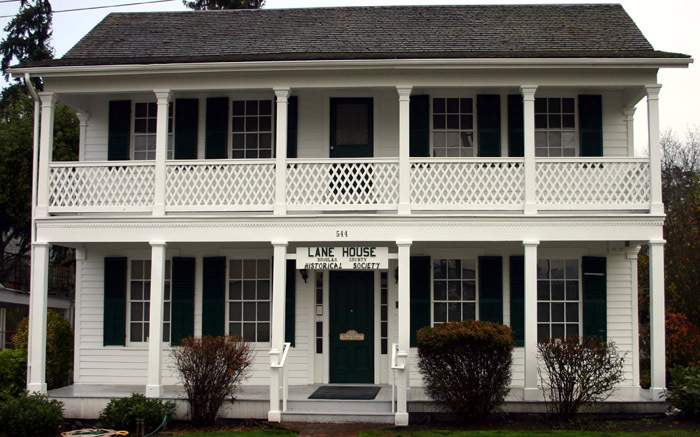 Lane House is also opened for special tours. Also: At Lane House we have some interesting collections of Post Cards, News Items. We can’t keep them out because of handling and exposure, But come visit on Saturdays or Sundays and ask the Hosts/ Hostesses to show them! Note: The article below was taken from a 1985 issue of the Umpqua Trapper. It was 1850 and the site of present day Roseburg, Oregon was only a grassy prairie lying along the present day South Umpqua River near the mouth of Deer Creek. A few scattered groves of trees could be seen when Aaron Rose, the founder of Roseburg, and his family arrived from Michigan to file their land claims and purchase squatters rights to what is now the city of Roseburg. The Roses platted a town site on their claims and began selling plots of land to business and families; at this time they also donated land for schools, churches and public buildings. One of the most historical homes in the city was built on a portion of this land claim by Solomon and Hyman Abraham, brothers and business men in the new city. This took place about 1860 and many interesting and historical happenings have taken place involving the Floed-Lane house which now belongs to the Douglas County Historical Society. It became apparent in 1953 that an organization should be formed to protect and preserve the historical records, artifacts and buildings in Douglas County which were important in the building of our county and the lives of the people who lived here. Many interested citizens, the county commissioners or court and officials of the city of Roseburg joined in this community effort. This meeting and those to follow were trying to do just that. 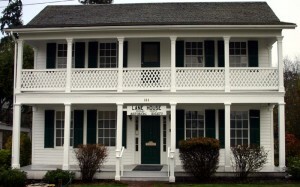 Lillie Lela Moore, a descendant of a prominent early Roseburg family, had just passed away leaving business property on Jackson Street and three lots on the corner of Washington and Rose Streets, which included the home of E. M. Moore, to the United States Government. The General Services Administration was planning to sell the property and the contents of the Moore house at public auction. The citizens of the county were trying to obtain the property for a museum and other projects. They knew full well that Lillie Moore had not intended this fate for her beloved home. A nominating committee was appointed with Mrs. Dave Busenbark, Mrs. Helen Clarke, Mrs. Natalie Baum, Miss Bess Clough and Paul Krueger serving. Nominated for President was Mrs. Christina Micelli, Vice President Mrs. Mabel Lewis, Secretary, Mrs. Allena Farenbaugh and Treasurer, Mrs. Leona Hill. A unanimous ballot was cast for this slate of officers and they were empowered to act for the group in incorporating the Society. Miss Lillie Moore died in Douglas County on May 14, 1940. She left a will bequeathing and devising all her property, with the exception of one item, to the United States. This property consisted of many old pieces of furniture which dated back to the 1850′s, the Moore property. The house was built in 1858 and was a cultural meeting place for the early pioneers. It was frequently visited by General Joseph Lane, the first Territorial governor of Oregon. Lillie Moore expressed the idea during her life that the home should be kept in the same condition that it was during her life, and that it remain as a monument. Petitions were duly circulated and signed. Several individuals wrote letters of endorsement to the Senators in Washington and were prepared to contact the President and General Services Administration. Senator Richard L. Neuberger worked diligently for the cause and our own County Court consisting of Judge V. T. Jackson and Commissioners Frank Ashley and Huron W. Clough endorsed the cause. All of these were recorded in the Congressional Record of the Senate in 1957. The County Court confirmed that “Miss Lillie Moore, for many years prior to her death, made drawings, and held conversations that would indicate her intention of bequeathing her property and estate for preservation of local history. The result of willing her estate to the United States Government is a miscarriage of her intent.” This she had done after land she owned in the area of present day Stewart Park was foreclosed upon at the time of obtaining property for the Veterans Administration Hospital which had been constructed in the county. She had planned on building a museum there in memory of her family. The county court endorsed support for the Neuberger bill that the land and half of the cash be returned to the Douglas County Historical Society for construction of a museum to recognize Lillie Moore’s intent. The “Neuberger – Porter Bill” was introduced in the United States Senate by Richard L. Neuberger and in the House by Congressman Charles O. Porter on April 24, 1957. A meeting was held in June of 1953 at the home of Rosa B. Parrott, a descendant of another early Roseburg family. Evidently the officers were changed as she was Vice President and Paul Krueger was Treasurer,. Three directors had also been added: Mrs C. C. Hill, D. N. Busenbark and Mrs. Arthur Clarke. Charter members were to be all members who joined the society before December 31, 1954. Interesting meetings were held throughout the county so that all residents could be told of the efforts being made to enlarge the group: The school house in Glide, Huron Clough home in Days Creek, the Grange Hall at Elkton, The Riddle home at Riddle, old school building at Melrose, the Nichols ranch in Riddle, the Lillie Moore house in Roseburg, also the Woman’s Club and Court House and Umpqua Hotel in Roseburg, the Ermil Briggs home in Canyonville which was the Fullerton Donation Land Claim, Floed House in Roseburg, the Central High School, the American Legion Hall in Roseburg, the Calapooia Club House west of Sutherlin. September of 1957 Local 1475 painters volunteered to paint the exterior of the Moore home. The grounds were cleaned up by the society and plans were being made. Charley Stanton wrote in his column “a small war is shaping up in Roseburg” “Will the Lillie Moore home end up a Museum or a parking lot.” The government stood strong on their plans and an auction was held December 13, 1958 at which time a group of Roseburg business men purchased the land and house. The Douglas County Historical Society was offered the house and given time to find a place to move it for a museum. The group tried to make plans and find a site in time. The furnishings were to go to the Historical Society. Finally the house was to be torn down because it was not in shape to withstand moving. The society had to pack up Lillie’s treasures and put them in storage. The society with the help of the county court were still planning towards a museum for historical artifacts. Sites were viewed and finally the county made plans to build a museum building at the County Fairgrounds where there was sufficient land already owned by the county. The Historical Society and others favored a site in town. Outlying taxpayers of the county felt too much was centered in the area of Roseburg and did not serve the residents as a whole. The Historical Society at this time decided to try on their own for a site to maintain and display the artifacts of the Moore home and other items they had collected. A blast caused by a fire near a parked truck loaded with explosives on August 7, 1959 in Roseburg was near enough to the Floed-Lane House to damage the roof and shatter the windows. The house was owned by Katherine Waite Bain the great- granddaughter of General Joseph and Polly Hart Lane. The Floed-Lane House has a distinguished history of its own as we have stated. It was a portion of the Donation Land Claim of Aaron Rose and his wife Sarah which is dated September 25, 1851. The Rose family sold this property to Solomon and Hyman Abraham in a deed dated January 10, 1860 that describes the land as being north of Douglas Street and reaching to the north line of the Rose claim, containing about one acre. The cost of this was $400 and it did not state if buildings were on it. On July 10, 1861 the Abrahams purchased from Aaron Rose an additional acre of land north of the first parcel for $200; the difference in price of the two parcels would indicate that buildings must have been present on the first parcel. March 16,1866 a deed was made to John Creed Floed by the Abrahams and their wives Julia (Mrs. Solomon Abraham) and Jane (Mrs. Hyman Abraham) for $2,000, this was for one acre more or less. J. C. Floed had married the daughter of General Lane in 1851 at Lynchburg, Virginia and traveled west with the Lane family in 1853. The families settled first near Winchester, Oregon where a business was owned by John. The Lane family lived between there and present Roseburg. When the county seat was moved from Winchester to Roseburg the Floed family moved also. When the Floed family purchased the Abraham property there was a partially completed house begun about 1860. The Plaindealer of May 27, 1876 mentions the Floed house as being two stories, this is as the house appears today. The next owners of this property were Simon Robert Lane and his second wife Catherine Ann Drain. Next the property was owned by Eva Lane Waite and her husband Douglas Waite. Katherine Waite Bain and her husband Walter Marion Bain owned the home at the time of the blast, along with the home just west of Floed -Lane house. On July 25, 1960 Katherine and Walter Bain deeded the Floed-Lane house to the Douglas County Historical Society for the purpose of establishing a Historical Monument in honor of the General Joseph Lane family. This made possible the dream of the society of a museum to house the properties of Lillie Moore and other artifacts they had accumulated. The Douglas County Court budgeted $5,000 for repairs to the building after the blast and for several years further amounts to help maintain it. After the County Museum was built this was discontinued. In the early 1860′s, after retirement from public life, General Joseph Lane and his wife moved from their home near Winchester and built a home near their son, Simon Lane who lived on North Deer Creek southeast of Roseburg near Lane Mountain which was called “Strawberry Hill.” The General and Polly lived there until her death in 1870 at which time he moved back to town and lived near his children on Southeast Douglas Street. He built a small house on property of his son LaFayette F. Lane on the South side of Douglas Street almost across the street from his daughter Emily Floed. Across the river lived his daughter Winnifred Lane who had married Lafayette Mosher in 1856 at Winchester, Oregon. Contrary to common belief the General lived in his own little house and spent time among the children living near by. The Floed-Lane house was never his dwelling place. The General’s home consisted of two rooms, one upstairs and one down. A fireplace on the main floor with an alcove for books and a desk. Upstairs a fireplace bedroom and alcove for clothes. After the General’s death in 1881 the two story house was moved back and connected to the L. F. Lane house which stood very near the corner of Spruce and Douglas, where it remained until purchased by the Douglas County Farm Bureau (now Douglas County Farmers Co-op). The dedication of the Floed-Lane house was held on August 18,1960 at which time the Lane family also held a family reunion. The home was to become a permanent memorial to General Joseph Lane and Polly Hart Lane and their families. It was not to be a museum but a historical monument to be furnished as in the days of General Lane. Guest speaker was Dr. Burt Brown Barker of Portland and Governor Mark O. Hatfield also attended. This beautiful home, which still remains in its original setting, was over the years the scene of many dinners, parties, weddings and other gatherings of the Lane family. The house is southern Colonial, it contains wooden pegs and square nails The ceilings are milled lumber and painted, the walls were covered with cheese cloth and papered. The shingles were hand hewn and the lumber rough sawed. The walk is of original brick, the Gloria Mundi apple tree in the backyard still bears fruit. The locust trees still remain and the shrubbery is typical of the period. The house had four upstairs bedrooms and two parlors, a dining room, kitchen and large storeroom downstairs. It also had a root cellar. General Lane spent many happy hours here sitting in the bay window gazing out at his friends and neighbors as they passed. A restoration project has been undertaken in the past few years to complete the long awaited repairs to the historic home. It has been a long struggle for the society and help has come from several projects. Grants have been received from the C. Giles Hunt Charitable trust and the Federal Historic Preservation Funds. Members have worked diligently towards the restoration goals of the society. Much is left to be done and funds are hard to come by. In 1982 C. Giles Hunt Fund awarded the Society $4,000 and with this we have restored the foundation, the front porch and rear porch replacing some beams and support posts, skirting, etc. Of interest to history buffs is this report from the termite contractor and the roofer that the present house had three distinct foundation outlines and that the roof was more than one framed roof. This is further confirmed by the 1876 Plaindealer report of the new two story home of Floed family. In 1984 the C. Giles Charitable Trust again awarded us $5,000 for further restoration of the house. With this the wiring has been completely repaired, the fireplace will be repaired and the balance used to restore the wooden floors to the correct time period. Then walls, ceilings and the kitchen will be started downstairs and then upstairs. The Douglas County Historical Society is a non-profit organization and for the thirty two years of its existence has faithfully carried on its projects. It is funded by memberships, donations and its two publications which are accomplished by volunteers. The first publication undertaken by the Society has just completed twenty years. The Umpqua Trapper began in 1965 with George B. Abdill its editor. The printer has always been the Myrtle Creek Mail owned by Hal and Portia Schiltz who later sold to Robert and Sharon Scherer who still operate it today under the name of Umpqua Free Press. The Trapper was in early days delivered to the printer by train as the editor at that time was employed as locomotive engineer by the Southern Pacific Railroad. George served as editor until his death in 1982. Portia Schiltz and Doris Bacon served as co-editors a year. At present Doris Bacon and Ella Mae Young serve as co-editors. Our book “Historic Douglas County, Oregon” was published in 1982 after one and one-half years of hard work. It has been received well by the public and was supported by local residents and the merchants of the county who submitted stories and historical ads for the publication. The book has paid for itself, supported the matching grant fund helping us repair our house and future proceeds from it will start our perpetual fund account with interest only being used for maintenance of the Floed-Lane property. The society is grateful for all of the public support over the years and with growing interest towards historical preservation we are looking forward to many years to come. We thank you very much. 1999: Readers will note that our present building fund, to which the proceeds from this book are dedicated, was established to build an auxiliary structure on the Lane House property to provide storage for Douglas County Historical Society papers and artifacts. This story was taken from a 1985 issue of the UMPQUA TRAPPER. It was reprinted in 1999 in the Treasures from the Trapper Book. You can read more and see even more pictures by buying the UMPQUA TRAPPER. Hey there–great to read the history of Roseburg. I would like to get the book, “Historic Douglas County, Oregon”. I am doing research on the historic buildings of Roseburg and I plan to make the trip to the museum in the near future to view all the historic artifacts. One day will probably not be long enough though. I also plan to visit the Floed-Lane house. Do you have any photos of another pioneer of Roseburg, George Kohlhagen? His name pops up on a lot of my searches. I know of two of the buildings that he owned–the apartments of course and the other on Rose or Jackson St. Anything to do with the history of Roseburg fascinates me. I can’t get enough. I am plotting a map placing all the original structures where they used to stand or still do and I am finding that alot of the original buildings still stand, but there are still more that have been torn down for commercial reasons. Anyway, great site and any information you could provide would be greatly appreciated. Thank you, Mark for the kudos. One of us here will have to research George Kohlhagen, and get back to you on that one. As for your project. You certainly picked a big one! But, you sound passionate and I’m sure you’ll get there. Good luck! !